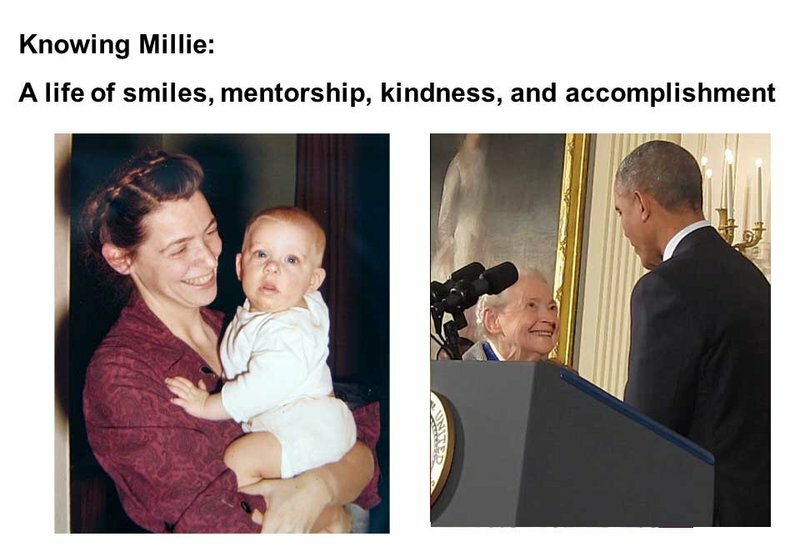 I’m honored to be here, just as I’m honored to be an associate of Millie’s for over 40 years. 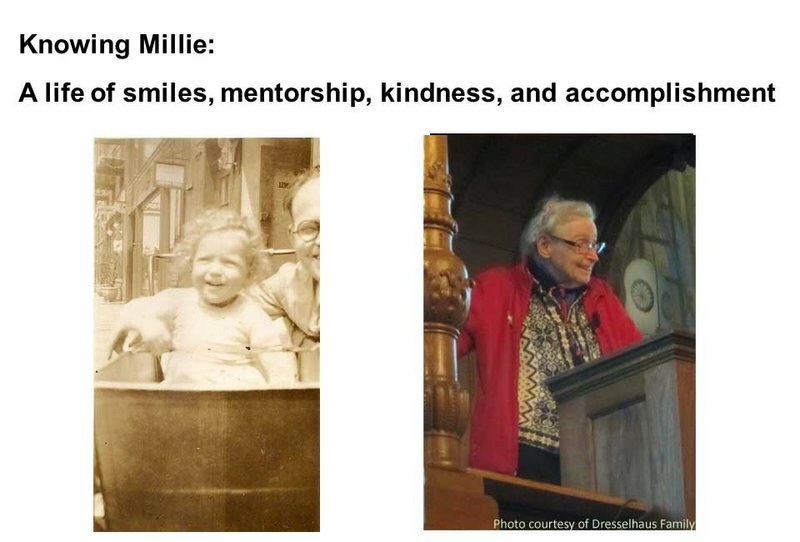 In fact, this is an introductory view graph I showed at the talk in Philadelphia a few months ago, when Millie was awarded the Franklin medal. 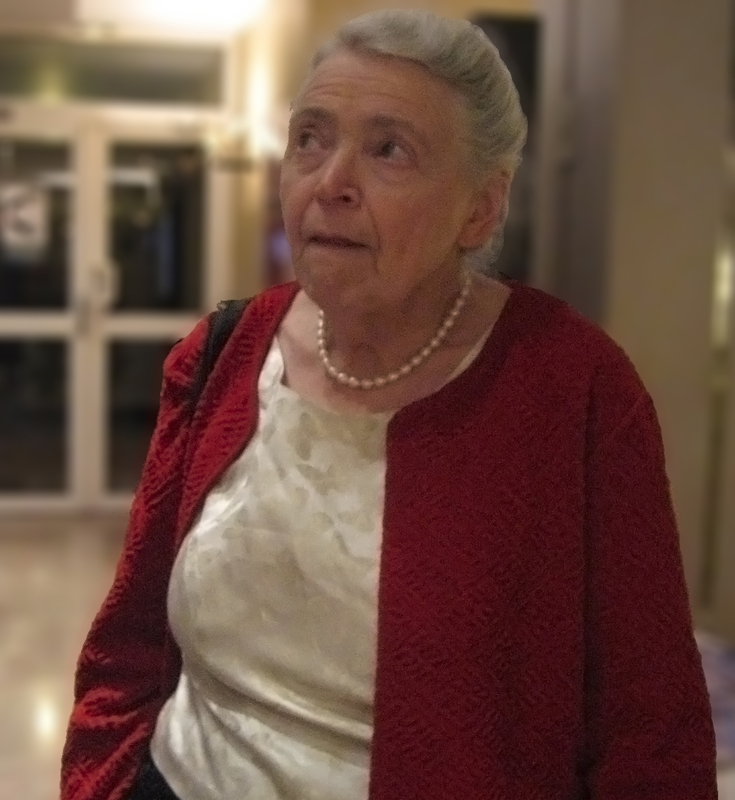 I wish I had time to tell you many stories about my personal interactions with Millie. I will just tell you a little bit about my background. I was Millie’s student for seven years, as both an undergraduate and graduate student. I did all my thesis work with her. I studied graphite intercalation compounds, and we did crystal growth and magnetotransport. As you will see, this is a research theme that I still pursue. This is what we do in our in our lab, although not with carbon. 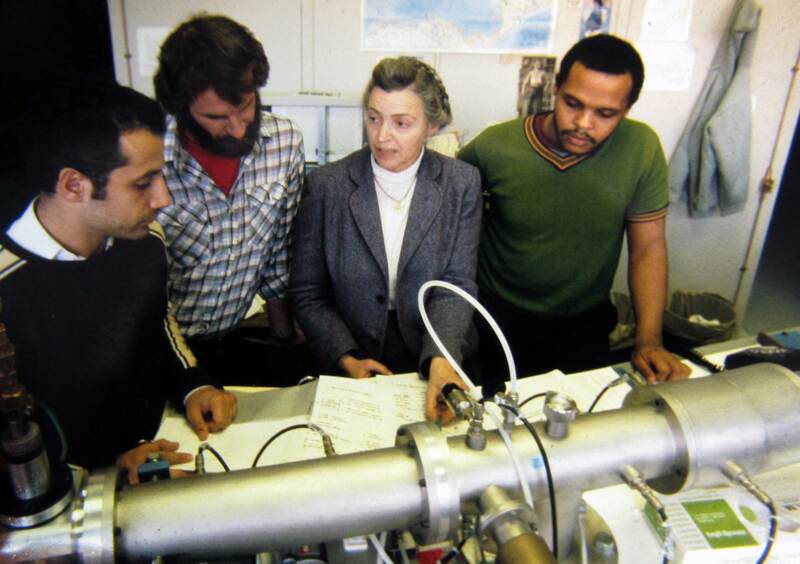 I believe that, in this picture, I’m probably trying to impress her with the hybrid magnet that we used back in those days. This is a C clamp. The story I’d like to tell is actually about my wife, here. We had a visitor, Jos Heremans, as well as a visitor from Japan, during that summer — near the end of the summer — and I mustered all my courage to introduce my girlfriend to Millie. Now, you’ve all seen Millie’s comments papers and theses — which I could show you, too — as she attempted to get those manuscripts good enough for her approval. But I don’t know how many of you have had the chance to get Millie’s approval on your girlfriend. When Millie first saw Anna — and Anna still reminds me of this; in fact she mentioned that I have to tell you this — Millie looked at Anna curiously, as if carefully examining her. Then she raised her eyebrows in that way Millie does when she contemplates something, and flicked her eyes up and down Anna, to examine her from head to tow. She did that three times, always with kind of a smile! But I couldn’t figure out if she was approving or not approving. She was quiet. And, indeed, once I got Millie’s approval, Anna and I got married. It’s been 40 years since then, and we’re still together and still very happy. Moving on to research! My field diverged from Millie’s in many ways — except for the crystal growth and 2D systems — but I could always tell, from a distance, that she approved. And that was very important to me. I will tell you a bit about what we do in this field. I believe it might not be so known to many of you in this room. So I’ll try to give you a little bit of an introduction, but I hope you appreciate the excitement. These are a couple of topics I’ll try to cover. And, before I do that, I’d like to thank my collaborators, the graduate students — some of whom have left and are at new and better places. And I’d also like to thank Loren Pfeiffer and his engineers, who are now at Princeton. Recently, we have been using the samples that they produce. Also, I’ll thank Roland Winkler for his calculations. 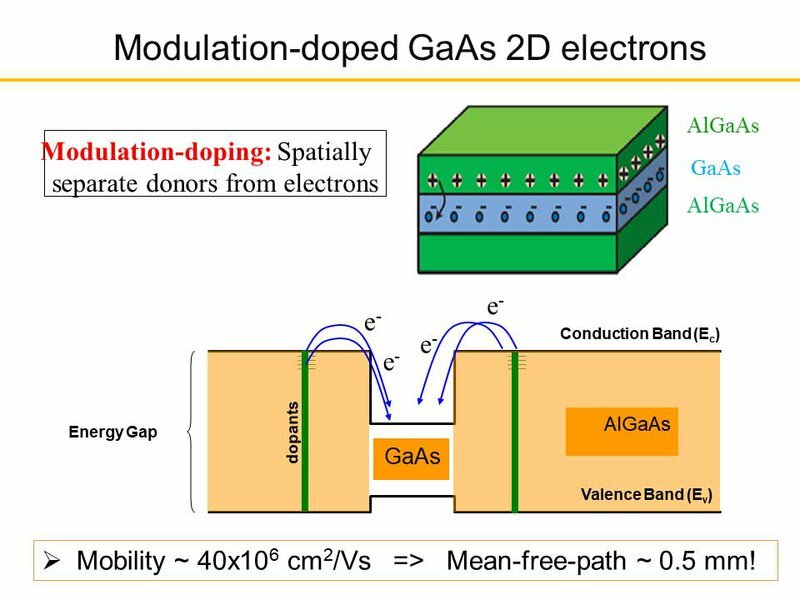 By way of introduction, let me just remind you that there exists the old-fashioned two dimensional electron systems to the carrier systems in semiconductors, and the way you do that is by sandwiching a material like gallium arsenide between aluminum gallium arsenide. These act as barriers. Then you dope the barrier material with (for example) silicon, and the silicon donates the electrons into this well. Thus, you get a two dimensional system. This is all confined in the direction of the 2D plane (as opposed to an out-of-plane direction). It turns out, you could put the dopants far away so that the electrons in the plane can move very far and fast for a given electric field. Yet they have the highest mobilities — on the order of 40 million centimeters square per volt second — at low temperatures, implying mean-free paths of about half a millimeter. There is, of course, a need to run a few experiments to study ballistic transport, when you do this. But today, my emphasis is not on the ballistic transport — I’ll be focusing on the many-body phenomena. I just want to remind you of the magic of gallium arsenide. 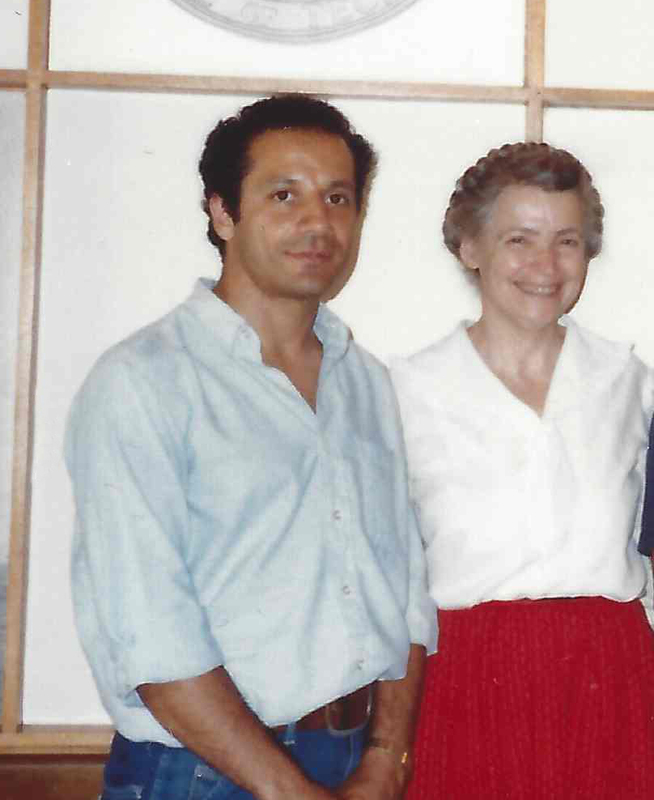 This is what fascinated me when I started my teaching position at Princeton. If you look at the slide above, this is gallium arsenide, aluminum arsenide heterostructures, superlattices. If you just pay attention to the image on the right — this is switching from gallium arsenide to aluminum arsenide, and if you look carefully, you will see every atom is in the right place. You can have a near perfect interface! This is the winning point, because the lattice constants match, so you get such a good interface. 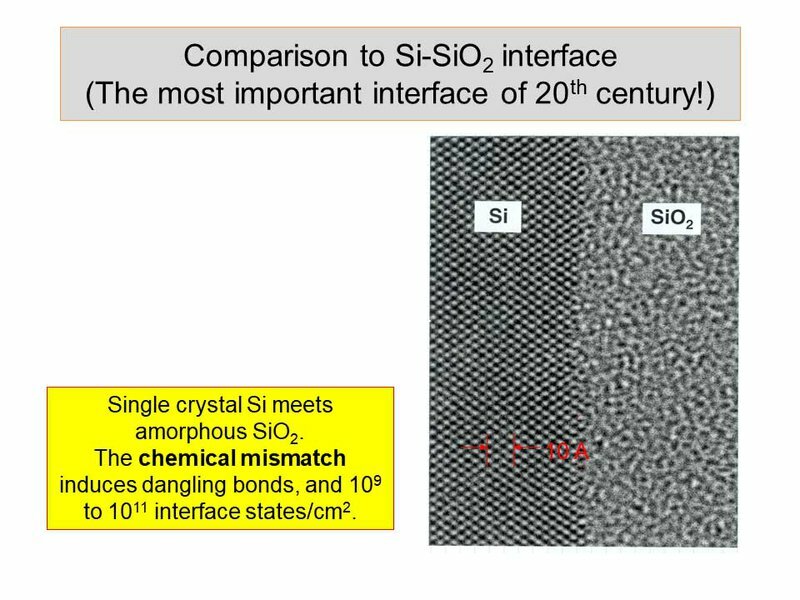 Just as a point of comparison, this is silicon-silicon dioxide. You could call this the most important interface of the 20th century — but notice what a big difference there is! That’s why gallium arsenide is so exciting. Over the years, people have tried to improve the growth of these materials. The key thing is purity. You want as few impurities as possible — except for, of course, the impurities that you put into the system intentionally that are far away. This is a SolidWorks picture of an MBE (Molecular Beam Epitaxy) system that now exists. This was designed by Loren Pfeiffer at Princeton. 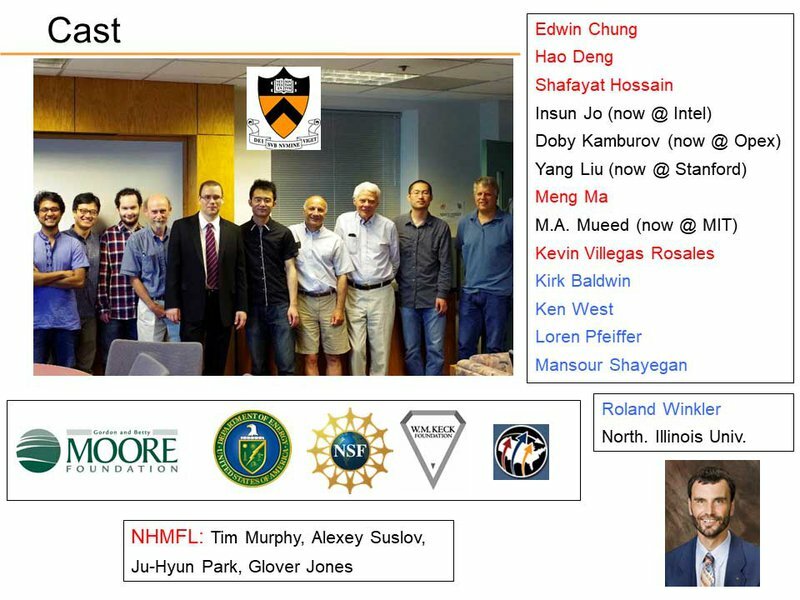 He came to Princeton a few years ago, and we began a very interesting collaboration together work that we have together. The special thing about this MBE system is that it has many pumps. There are four gigantic pumps with gigantic valves. 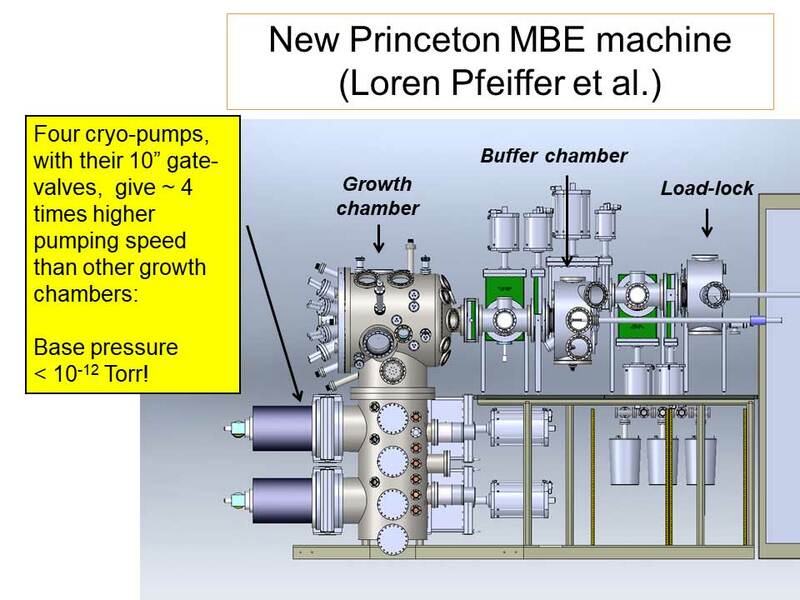 This gives about four times higher pumping speed than any other growth chamber that I know of. That really helps with the purity of the material and, eventually, it also helps increase the number and quality of the experiments that we can do. I’ll go back to that, a little later. The physics of the system is captured here. You put these 2D electron systems in a perpendicular field. 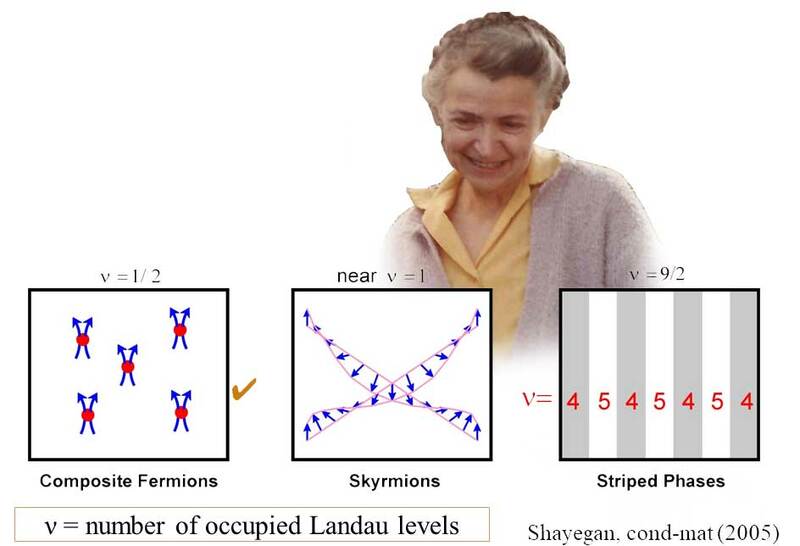 That splits the density of states into a set of Landau levels — delta functions, if there is no disorder. And as you raise the magnetic field, fewer and fewer of these levels are occupied, so that, eventually, your Fermi level is deep into the slowest Landau level and the filling factor (which is density divided by the degeneracy) is given by this number. Essentially, it’s the fraction of this last level that is occupied. And once it gets to the factional regime, that’s when much of the excitement begins! Over the past 35 years or so, many phases have been discovered in this system — except for the integer quantum Hall effect, which was discovered in silicon-silicon dioxide — but all the rest have been discovered in gallium arsenide systems and, of course, later on, in other 2D systems. One is the fractional quantum Hall effect. For example at ⅓, with its many-body wave function, at very high fields, very low fillings. 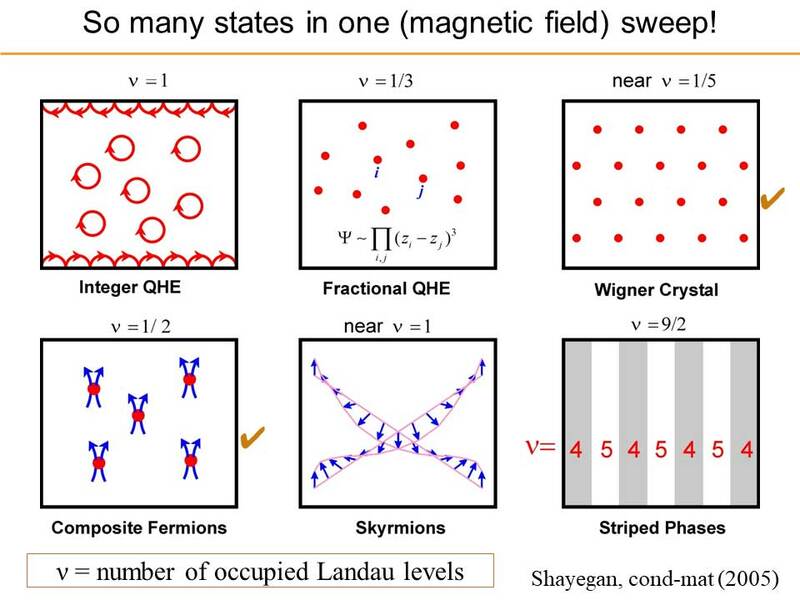 When the last Landau level is only ⅕ filled (or less) you get the Wigner Crystal (in other words, an ordered array of electrons). This is a very interesting phase. This is near ½. So you have this last Landau level exactly half full. And the system behaves as if it’s a metal. What theorists told us is happening is that each electron captures 2 flux quanta, and that takes care of the external field. So, essentially, you have particles — these composite fermions — moving as if there is no external field, even though there is a perpendicular field of 10-15 Tesla. That’s fascinating, because this means it has a Fermi surface. I will talk a little more about that later. There are other phases: stripe phases, skyrmions, and more keep coming as we go on. A couple of topics I want to tell you about, briefly. 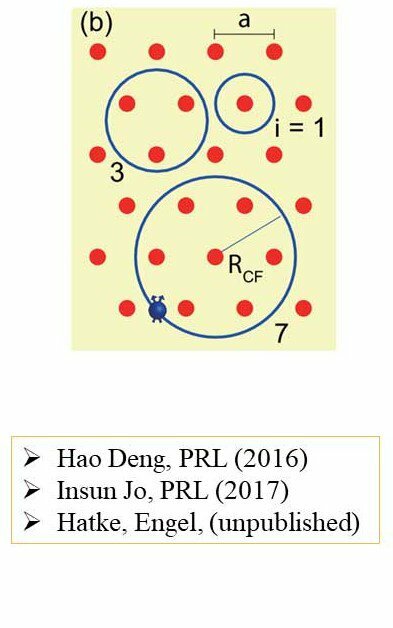 One is the Fermi surface of these composite fermions. 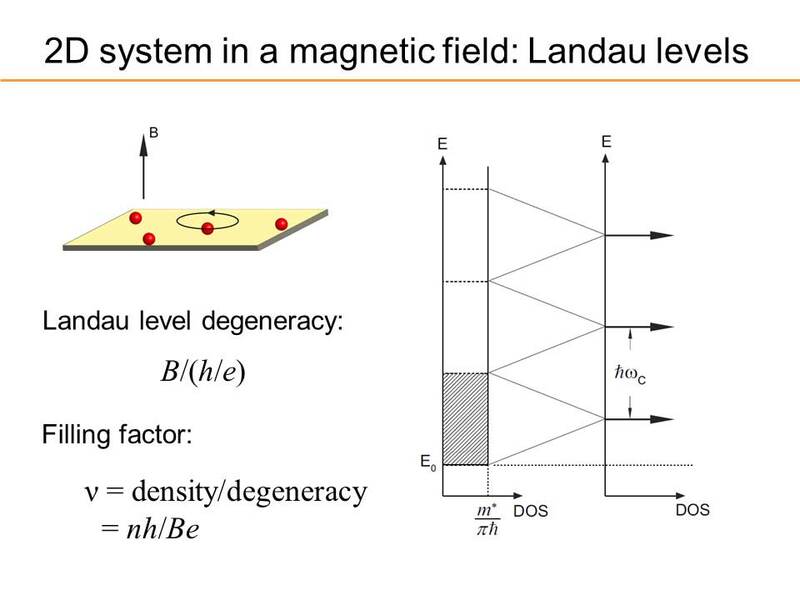 So again, to recap, we’ve got the last Landau level ½ filled, exactly, and even though there is zero magnetic field, we still have a very high external field of 10-15 Tesla. And when this happens, the fluxes magically go to the electrons, and wind up with a free electron system. It ignores interaction, and it ignores the perpendicular field. It’s as if it’s a zero field! So, logically, it should have a Fermi surface. And this has been verified by many experiments. I draw this bigger than the zero field, because this is typically spin-polarized because you’re are at a higher magnetic field, so the area is two times as big. The specific question that we have been addressing, for the past few years, is this: if you have a circular Fermi surface, here, then you would expect the circular Fermi sea, also, here — what if this is anisotropic? What would you get, here? The answer from theorists, at least initially, was that it’s not obvious what you’d get. I could get into why, but I don’t have time, so just take my word on it: what happens in an anisotropic system is not clear. To make a long story short, we tried this ourselves in different experiments in different systems. Below is the one that, I believe, is most clear, and it just came out a few months ago. These are two dimensional holes. Not electrons. That’s because we can tune their Fermi surface much more easily with strain. So we apply strain to the system. That’s a very simple technique. We just glue the sample with good German Glue — UHU, with two part epoxy — to the piezo. This is a piezo that’s stacked, piezoelectric. And when you apply a voltage of, say, 100 volts, the piezo expands in this direction and that stretches the sample. Of course, in the perpendicular direction, it shrinks. So we can strain the sample, and that leads to a distortion of the Fermi contour, as shown here. These are theoretical calculations done by Roland Winkler. But, as I’ll show you, the experiments are in agreement. 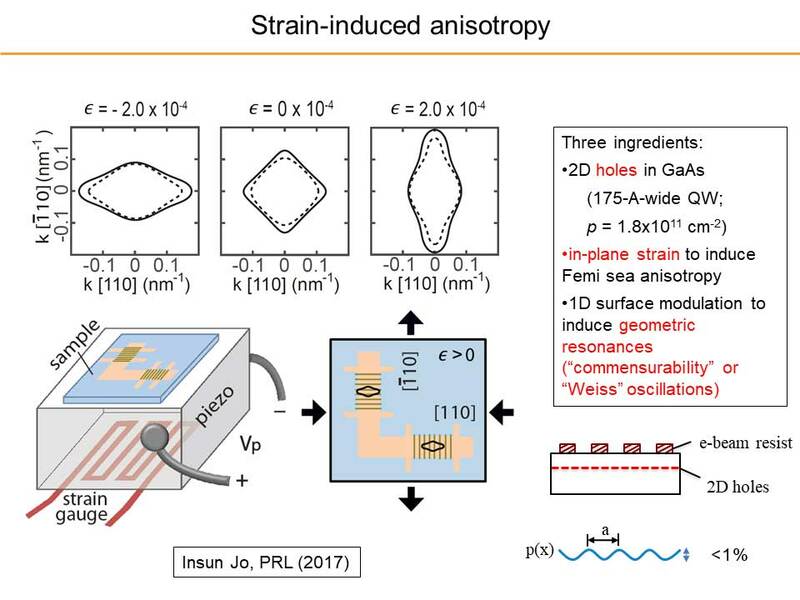 So it becomes very anisotropic for a positive or negative strain. 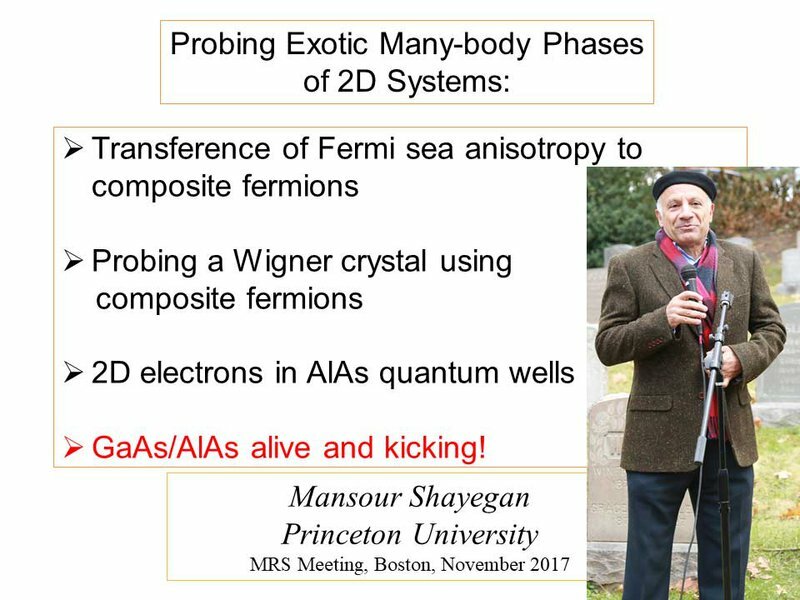 The next thing we do is probe the Fermi wave vector, directly. This is done by geometric resonance measurements. We have a periodic density modulation of the 2D holes. We do that by depositing stripes of photoresist. So that produces a very gentle modulation through some strain that propagates down. 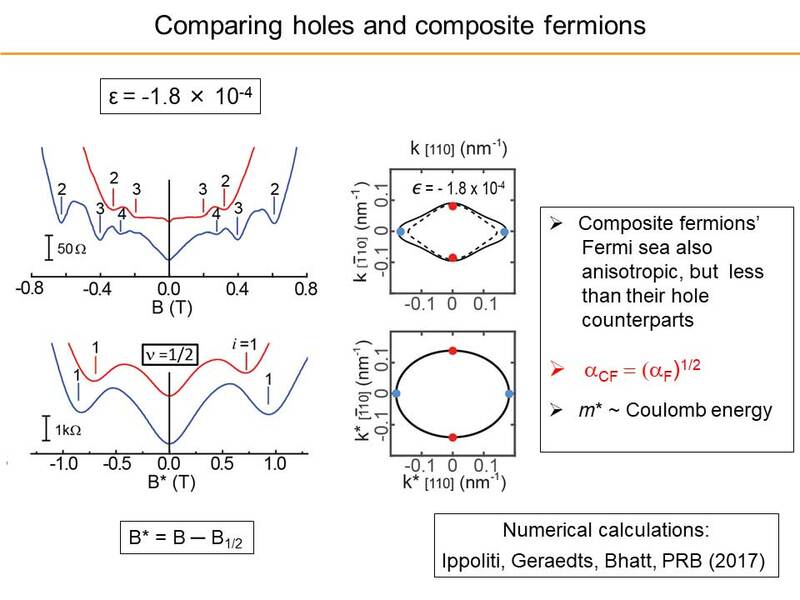 The composite fermions or holes then go in circles, whenever their Fermi cyclotron diameter matches the period. They show features in the resistance, essentially — a minimum in the resistance. And from the positions of the field, we can directly get the Fermi wave vector. These are the results. These circles are the values. This is the data. This is near ½, so it’s around 15 Tesla, and these are the geometric resonances that we see. This is near zero field. Long story short, what we find is that the anisotropy of the whole Fermi contour of the zero field particles indeed gets transferred to the composite fermions. But there was a surprise! It goes as the square root of the anisotropy. If you define the long axis to short axis as the ratio of anisotropy for the Fermi wave vectors for composite fermions, that ratio goes the square root of the ratio for here. 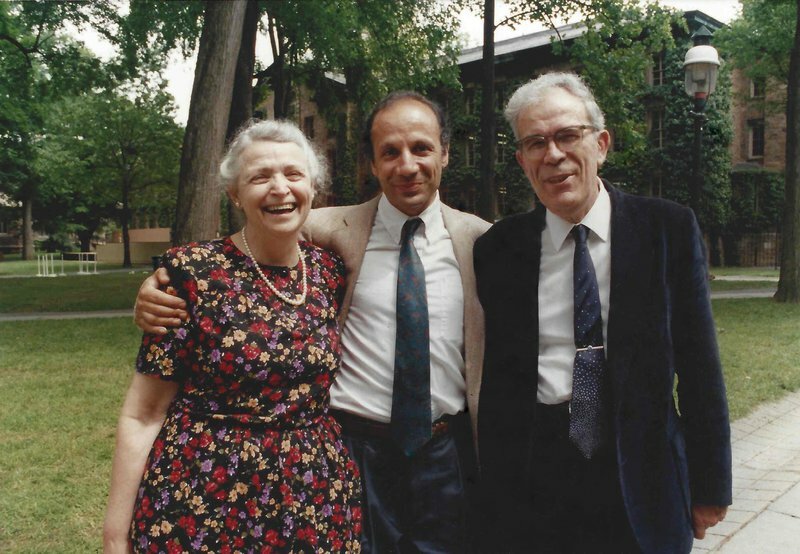 There are numerical calculations explaining this, of course, but the hand-waving argument that one can give is: the composite fermions are a result of interaction. They have vective mass which is related to the Coulomb energy, and if the Coulomb energy is anisotropic, the mass is anisotropic, and that leads to the Fermi wave vector. So that explains the square root. This is another example just to show you what you could do with these systems. 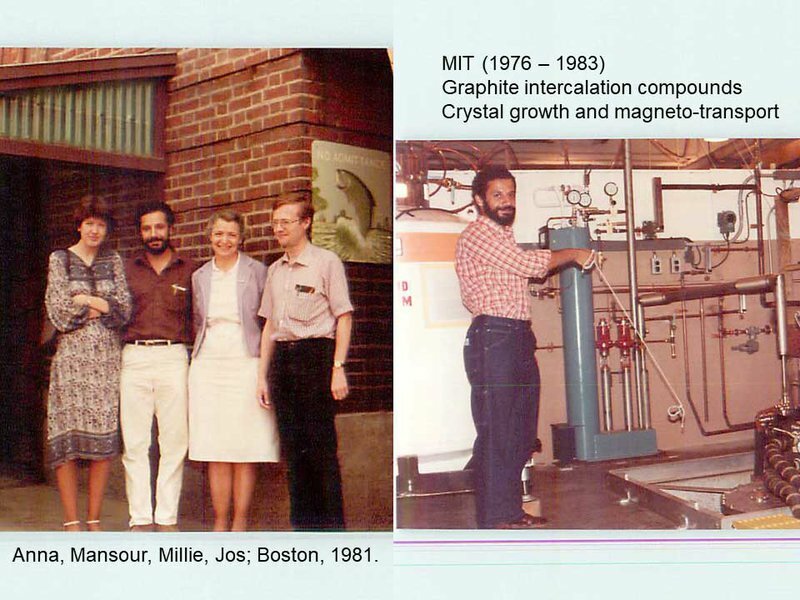 You remember I mentioned to this Wigner Crystal at very high fields or at very low fields? The point is, it has never been directly probed. I mean, what you want to do is use X-rays, but that’s not so easy to do because the density is very low, so you don’t want to hit it with high energy. Therefore, the experiment that we came up with is to make a bilayer system. One of the layers is at very low fillings in the Landau level. 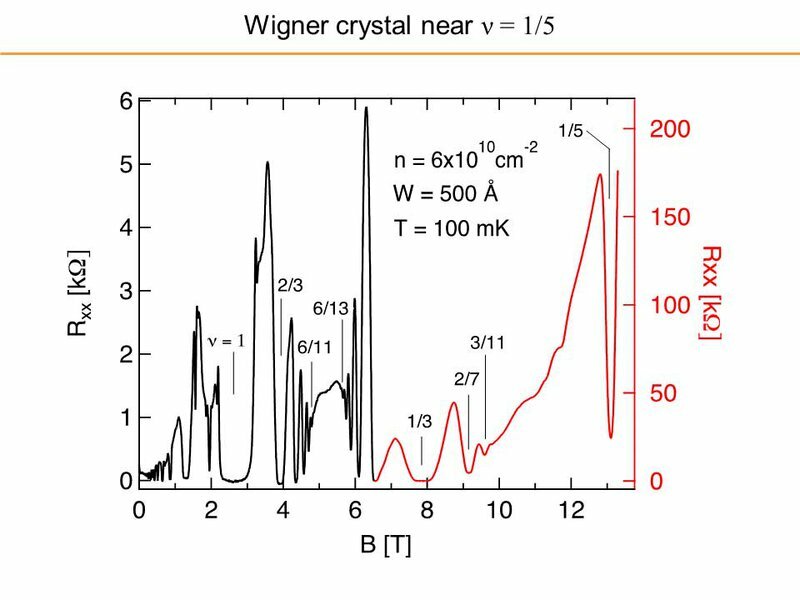 That layer shows a Wigner crystal — or, at least, we expect it to have a Wigner crystal. The other layer we tune so that it’s exactly ½ filled in the last Landau level, meaning we have composite fermions. 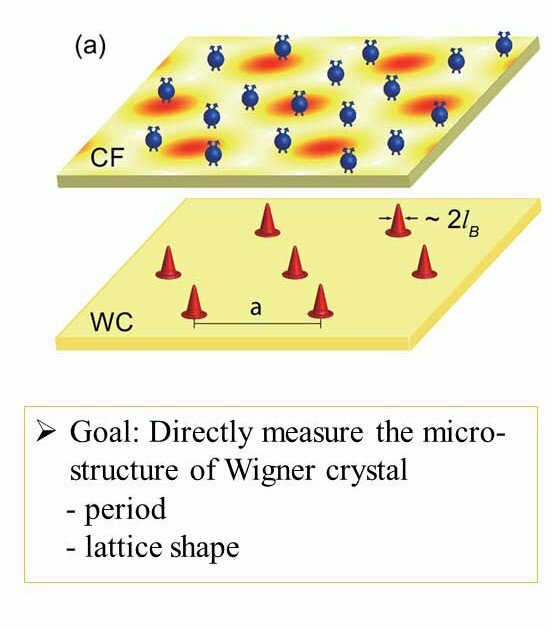 These two layers are very close, so the composite fermions would feel the periodic potential from the Wigner crystal. So as they go around their cyclotron motion, they will show a geometric resonance whenever the orbit goes around 1, or 3, or 7. Indeed, in the experiments, we see signatures of such orbits, and that gives us a direct measurement of both the period and the lattice shape — and in these triangular icons on the slide above. So again, these are some indications about what’s really happening. My last topic is this aluminum arsenide. 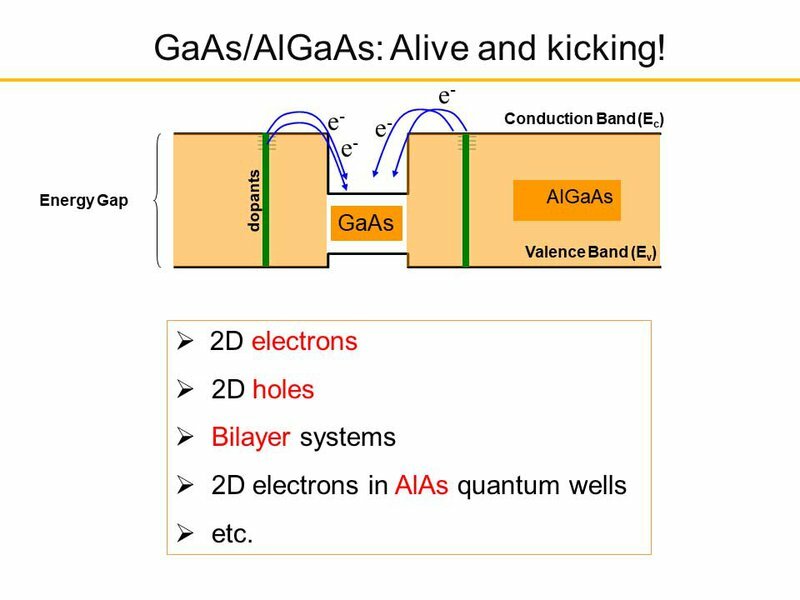 We’ve mentioned electrons, holes, bilayers. Well, you could put electrons into aluminum arsenide! Now, normally that’s a barrier, so many people would not think that that’s possible. But, it turns out, if you just replace this layer with aluminum arsenide at the X point of the Brillouin zone — it has to be near the edge of the Brouillon zone, because the energy is lower, there (at a minimum for aluminum arsenide) — then, indeed, you could trap electrons at that spot. It turns out that, if you do create this, it’s a very interesting system. Unlike gallium arsenide, whose Fermi surface is near the gamma point (at the center), this is at the edges. Similar to silicon, this system has multiple valleys, and with these masses, those valleys are anisotropic. Furthermore, by applying in-plane strain and changing the well width, you could essentially pick any of these values that you want. 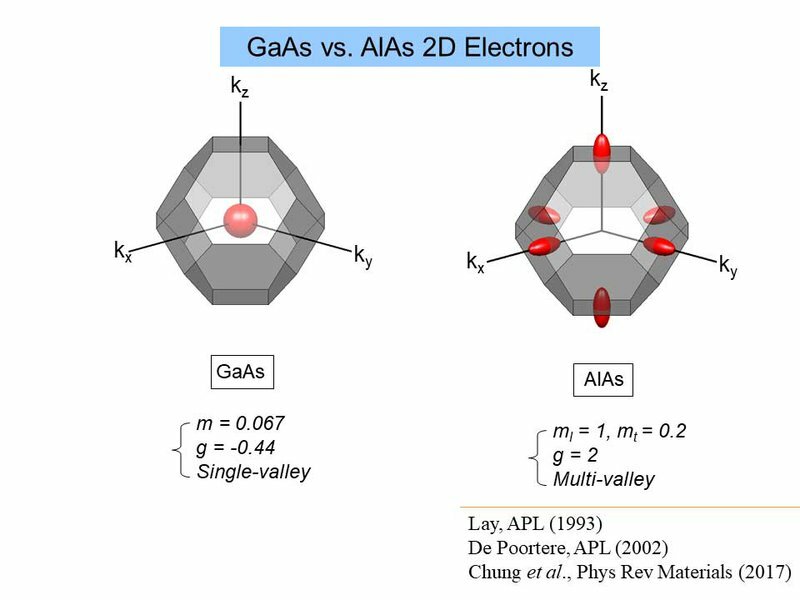 You could transfer electrons from one valley to another. In fact, this forms the basis for a valleytronics. The very first paper that did this was one of our papers, in 2006, “Controlling the Electronic Properties and Talking about Valley Filters.” You could do this in this system. The current exciting news is that, very recently — within the past few months, in fact — we have had a breakthrough with this very high purity MBE system. Turns out, aluminum is nasty, because it’s very hygroscopic (it absorbs water). So if you have the slightest leak or problem in the MBE, you can’t create high quality aluminum arsenide. Therefore, even though we had grown samples that showed fractional quantum Hall effects, we never had a very high level of quality in those samples. This data is a couple of weeks old. For those of you who have trained your eyes to see fractional quantum Hall effects, you’ll notice that there are many, many minima here, and the higher order ones are only shown or seen in the highest quality samples. This phenomenon is almost comparable to some of the best gallium arsenide samples. 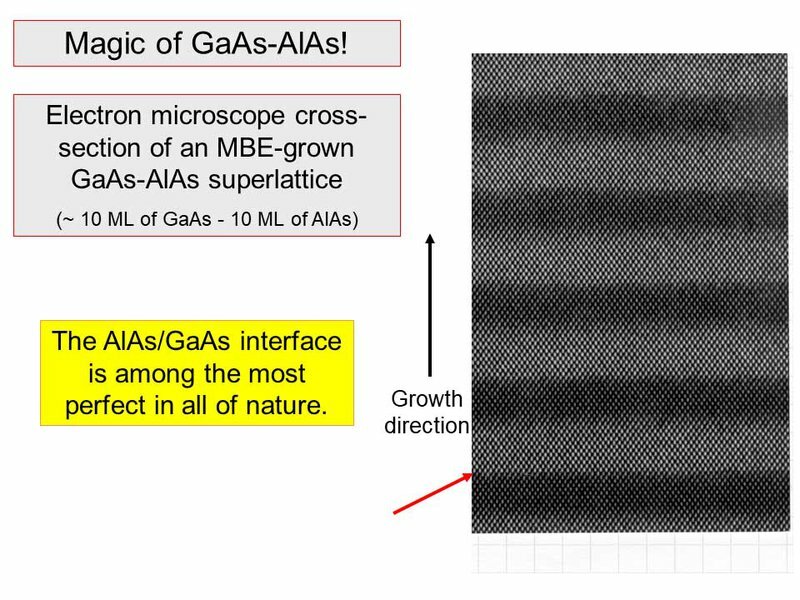 In terms of mobility, our aluminum arsenide bilayer sample shows a few million centimeter square per volt per second of mobility, which is amazing. So we are very excited about this. This is another sample that has slightly lower density, and now you can clearly the Wigner Crystal. How? 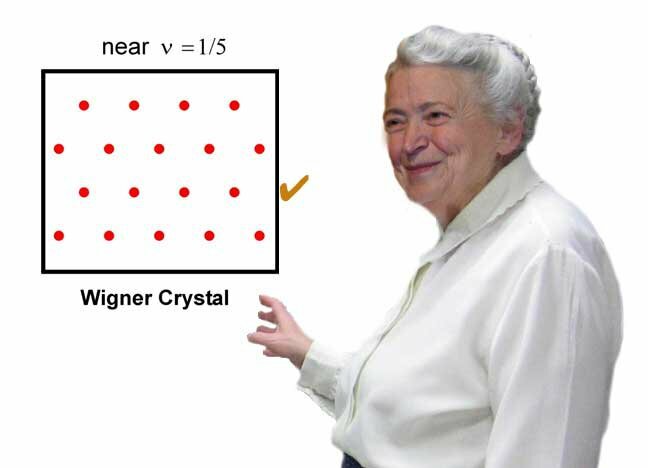 This resistance, here, goes to a fraction of a megaohm — and that’s the signature of a Wigner crystal. So we can actually see this phase, and perhaps many others as well. I’d just like to finish up with another anecdote about Millie. A lot of you have been showing her emails. I would like to show you an email that Millie sent me, in December of last year. This is after our new president was elected but before he’d taken office. Some of you may know that, back in Bush’s presidency, there was a Muslim registry ban. It never really got abolished. 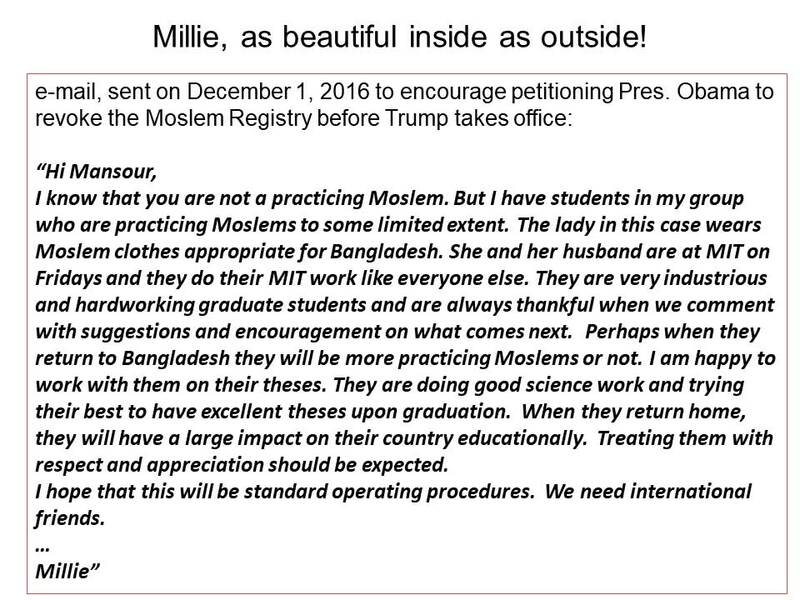 So there was a petition going around, in December 2016, asking people to urge Obama to revoke the Muslim registry ban in order to make it harder for the next president to do anything. Anyhow, I’ll stop here. Thank you.